This is a turbine base for a 100m turbine, a relative minnow in modern parlance. Already a large quantity of concrete has been poured and now the steel work is in place for the cap to be added. This will require in excess of fifty lorries full of concrete. Cement is one of the worst elements created by man as regards carbon footprint and yet we are told by government and developers how green wind farms are because the wind is free. So is coal, gas, thorium or oil at source. It is the harvesting that costs money, as it does with wind. This base will never be removed but simply covered over at the end of the wind farms life. The damage to the eco system, water run off and the peat moorland that it displaces will remain for millenia. Modern techniques can reduce the half lifes of nuclear elements which can then be disposed of. These concrete bases are simply too expensive and too difficult to remove. Multiply this by the many thousand already installed and by the tens of thousands needed to meet the EU Climate Change targets and we see the truth that wind energy is neither green nor friendly. This entry was posted in Technical, Wind farms. Bookmark the permalink. The you must add in the excavation and crushing of the aggregate used to make the haul and access roads. Then add in the huge environmental damage in China to mine the minerals required to make the massive magnets for the turbines. Then there’s the strengthening and upgrading of the roads to get the turbines, towers and blades from the ports to the site of the wind power stations. The the real biggy: The strengthening of the National Grid so it doesn’t fall over for the brief intervals that the wind energy comes on stream. Oh – and don’t forget the new custom built gas power stations that are going to have to be built that can cope with the fast start-up and shut-down cycles required to work alongside the very peaky wind energy output. will the powerful magnets affect our compasses for navigating….I would have thought so? Interesting supposition. A slight deviatian in bad weather for a hill walker could have lethal consequences and the proliferation of off-shore wind farms might well affect shipping. Aircraft tend to rely more on gyros that are set against a compass before take off so will be less subject to this and large ships work more to GPS, but it might well affect leisure yatchs and small inshore fishing boats, although even they rely more and more on the ubiquitous GPS electronic box of tricks. When all these gizmos fail it is reversion to Mk 1 eyeball. I would how many modern navigators will manage that? This picture is a reminder of the double standards and breath taking arrogance exhibited by the Dumnglass Estate, earlier this year, when it posted notices headed “Wake for the Wild” which asked the protesters to be careful not to disturb nesting birds and “avoid damage to the ground”!!!!!!!!!!!!! 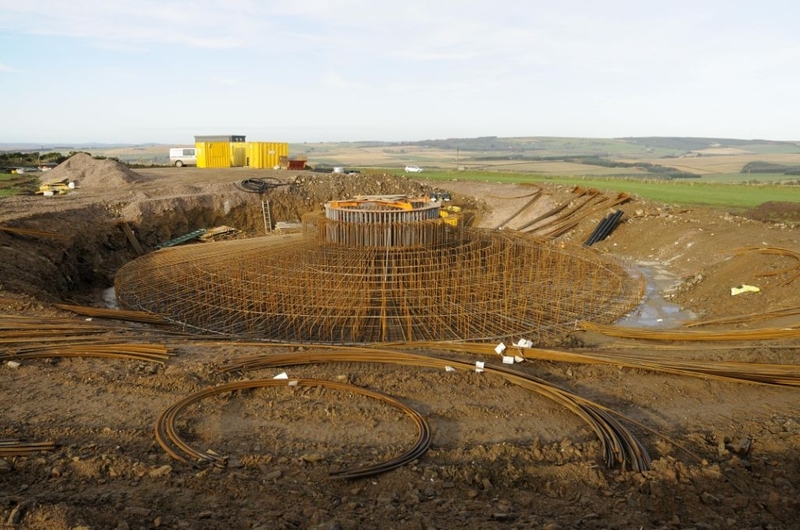 For an entire 100 MW nuclear breeder reactor, according to the designers at arcnuclear.com, you would put it underground in a hole big enough for a cylinder 16 metres high, diameter 8 metres. I believe that’s quite a bit less than the base for that miserable 100 metre turbine. I suspect it gives you less than 2.5 MW maximum, in half a gale. The ARC100 reactor receives a “fuel cartridge” weighing 20.7 tonnes, and in the course of 20 years, running at 90% capacity factor (i.e. an average of 90 MW, day and night) actually consumes about 1.7 tonnes of the fuel. Enough of the rest has been converted from non-fissile U-238 into fissile Pu-239, and some of the latter into bomb-poisoning Pu-240, that it can be refurbished into a cartridge as good as the starter, by taking out 1.7 tons of waste products (fission products) and rebuilding it with the same mass of un-enriched uranium, or even uranium from the copious storage dumps of “depleted” uranium. This, design by the way, was proven immune to the meltdown problem of TMI, Fukushima, and even Chernobyl, in April 1986, a week before Chernobyl. In part because the coolant is liquid metal, and the fuel is metallic, not ceramic, a temperature higher than it is designed for will stop the chain reaction. The spaces between the target atoms get bigger, just enough to lose neutrons to the outer barrier. The liquid sodium coolant gets rid of the heat by convection. It is my strong suspicion that this technology is not a great moneymaker for the “energy companies” When Thatcher sold off the CEGB to private hands, something like half of the reactors mysteriously became unprofitable, and have been decommissioned. The rest were owned by British Energyy, which is now a subsidiary of a French company.